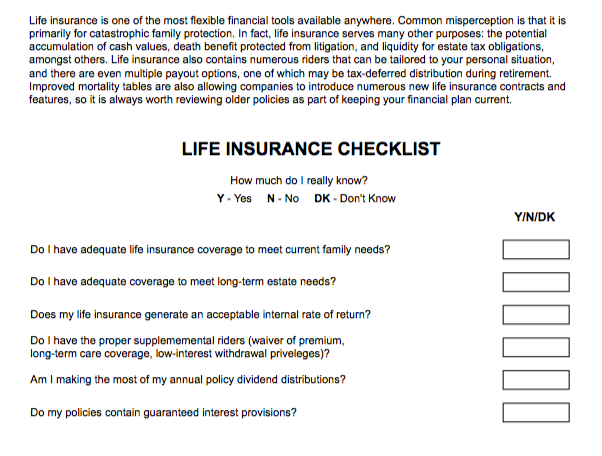 Life insurance is one of the most flexible financial tools available anywhere. Common misperception is that it is primarily for catastrophic family protection. In fact, life insurance serves many other purposes: the potential accumulation of cash values, death benefit protected from litigation, and liquidity for estate tax obligations, amongst others. Life insurance also contains numerous riders that can be tailored to your personal situation, and there are even multiple payout options, one of which may be tax-deferred distribution during retirement. Improved mortality tables are also allowing companies to introduce numerous new life insurance contracts and features, so it is always worth reviewing older policies as part of keeping your financial plan current. Sometimes you don’t get a second chance to provide for the ones you love. How important is life insurance to you? Please note if you are considering the purchase of life insurance these products of life insurance are, first and foremost, life insurance products designed primarily to provide a death benefit. The ability to use accumulated value (if any) as supplemental retirement savings or supplemental income would be secondary additional benefit. Policy loans and withdrawals will reduce the ultimate cash value and death benefit. The majority of the life insurance products that accumulate cash value will have a surrender charge, for a specified period of time, on withdrawals from the policy.